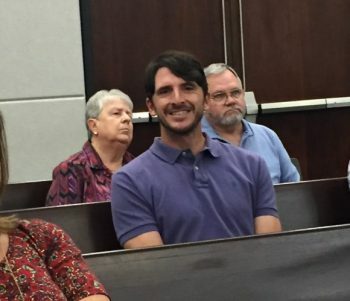 Ross Berthelot, two months after the parish Planning Commission denied his 105-lot subdivision proposed at the intersection of Cannon/Roddy, took his smug half-a-mile north on Irma Blvd to Gonzales City Hall on Monday. His company, Berthelot Holdings, is proposing “42 single family residential lots…on Pecan Grove Avenue,” 200′ from the elementary school of the same name. Gonzales Planning Commission accepted the plat introduction, requiring Berthelot to bring a “letter of approval and comments from the School Board before it goes to the (City) Council for approval. Berthelot has a week to appeal left to appeal the denial of Amalfi Cove by the parish Planning Commission on December 12, 2018. MEMO to O’Neal Parenton: The city council, not the Planning Commission, is the final say on Preliminary Plat approvals. Gonzales Planning Commission, from left: Scott Hughes, Lane Edmonston, Chairman Frank Cagnolatti, John Lanoux, and Eddie Williams. Newly appointed commissioner Scott Hughes moved to table Berthelot’s submission until he presented the information requested but, since Monday’s proceeding was only an introduction, he withdrew that motion. Berthelot must come back to the commission for public hearing and, once the body opines, the final decision is the council’s to make. The Public Hearing is scheduled for the commission’s March 4 meeting. It was recommended for approval by the commission and will proceed to the City Council on a date to be determined. The commission requested drawings of a planned unit for that council meeting.